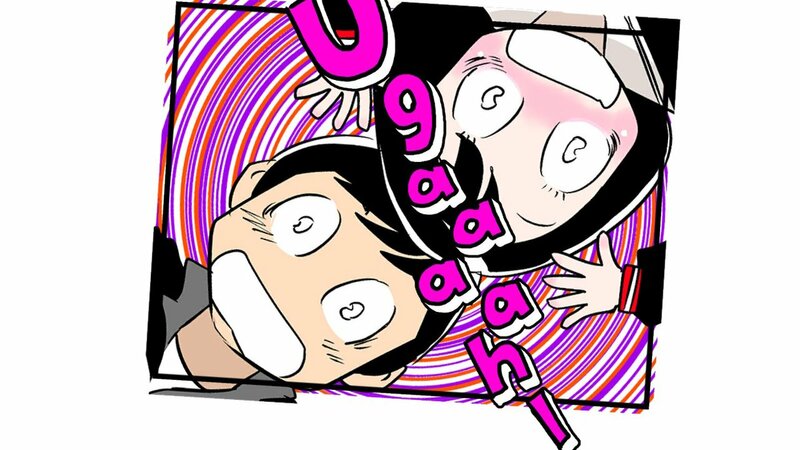 Gal Metal is one of those games I never thought we’d see outside of Japan. Where else does this come from but the mind of Tak Fujii, the famed Japanese developer who’s been behind such projects as No More Heroes and Ninety Nine Nights II. It has a fortunate place on the Nintendo Switch, a system that, because it’s region free, is open to every kind of weirdo game. 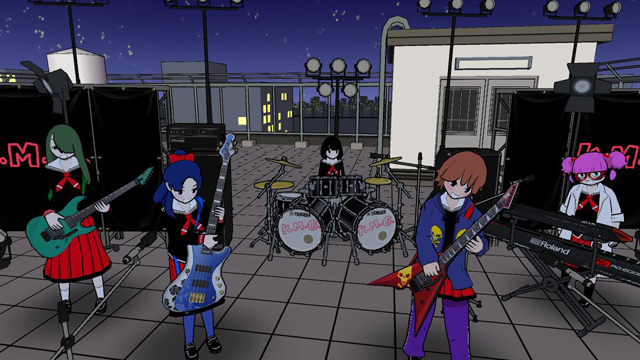 Months later after hitting Japan, Gal Metal is finally available in the West, and it’s a strange, quirky little music game in all the best ways. 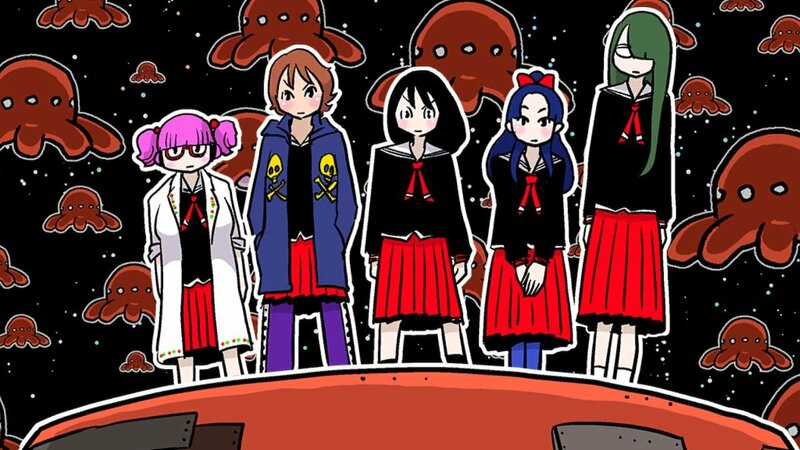 The humorous tone of Gal Metal reveals itself very early when some freaky octopus aliens invade Earth and, Freaky Friday-style, merge the minds and bodies of two high school students as an “experiment”. Now this boy must live in the mind and shoes of Rinko Hoshino, who herself partakes in an after-school metal band group. 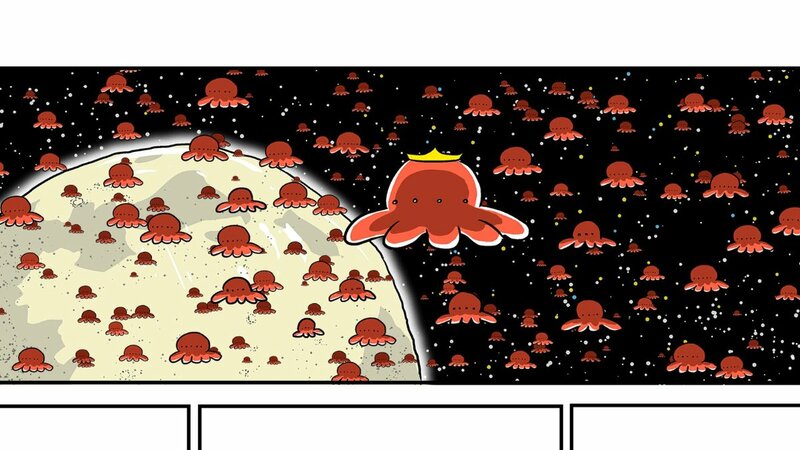 Across rooftops, construction sites, outer-space, and even escaping the void of black holes, together they just might save the Earth with the power of heavy metal rock. The 13 metal songs inside Gal Metal have a great catchy beat to them. They’re delicious ear worms to listen to even if you’re not into the genre that is heavy metal music. In differing from music game norms, there is no streaming note chart on the screen, as you’d see in, say, Rock Band. Following any hypothetical charts to clear the song will rely on your own memory. In the art of play, making noise with the drum set is all well and good, but random, rudimentary beats won’t get you a high score. How you rock out is up to you, and scoring is rather generous that I never failed a single tune. But really, your brain is going to tell you that you want to perform the best, like no drummer ever was. Learning all the drum combos, both simple and extravagantly complex, will practically require a spreadsheet and a PhD to memorize. Add in the subtle depth of which combos work best with certain songs, and you’ve got a richer scoring system than expected. It’s balanced to be generous towards less-experienced players and reward experts to learn the intricacies of the timing mechanics, essential for getting higher rankings. Practice mode will highlight the recommended rhythms in upcoming tunes, but mastering a variety of complex ones is key to earning not just a high score, but a rank higher than C as well. 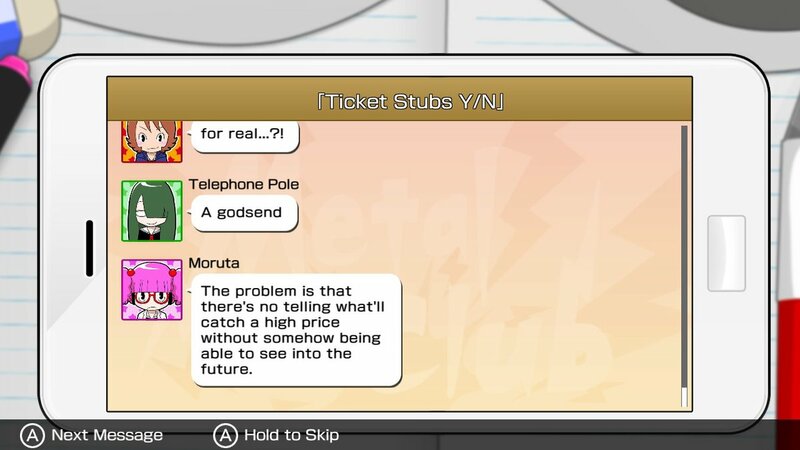 Small in-game notes upon completion are the main clues you’ll get to figuring out how to master Gal Metal‘s subtle depths. Between gigs, you’ll encounter an overworld map with a heaping helping of menus. It may look intimidating at first, but the systems become quickly apparent. Travelling around town to the shops, movies, the park for work and play will boost your stats that affects musical performances. Each visit to a location drains some stamina and time, and when you’ve exhausted your stamina, it’s time to battle aliens by playing the drums. Some gig sessions like to shake up the formula with some new challenges, like aliens that spray ink to cover the drum set, or ones that make a shrill noise muting the sound, forcing you to adapt on the fly. Those moments are all too few and fleeting, as most gigs stick to routine with no interruptions. More variety in the campaign would not have hurt, but you can try each style on every song within Free Play. Drumming controls come in three flavors: button, touch, and Joy-Con motion. When swinging the Joy-Cons like a drummer as a surrogate for drum sticks, the motion is a fun novelty. If you’re trying to play for a serious high score, they can be a bit unreliable in keeping up with more difficult songs (unless you change the settings of the motion). I would recommend jamming with motion controls on the easier songs, or for kids who want to mime the act of rocking out. The touch controls prove reliable for accuracy, with a potential roadblock coming from larger hands blocking the screen (and greasing up the Switch’s touch screen as well). For the right balance, traditional button controls are simple and precise. Literally, two buttons are all you need to succeed in the musical segments. From my observation, the rear triggers on the Joy-Cons are sometimes too mushy for the precision needed in more meticulous rhythms. I recommend experimenting with finding which controller is best for you to reliably hit the buttons needed to keep up on the more demanding rhythms. Despite having a full in-game drum suite at your disposal, no rhythm set ever asks you to play with more than the two buttons, so I couldn’t tell that they affected the score. 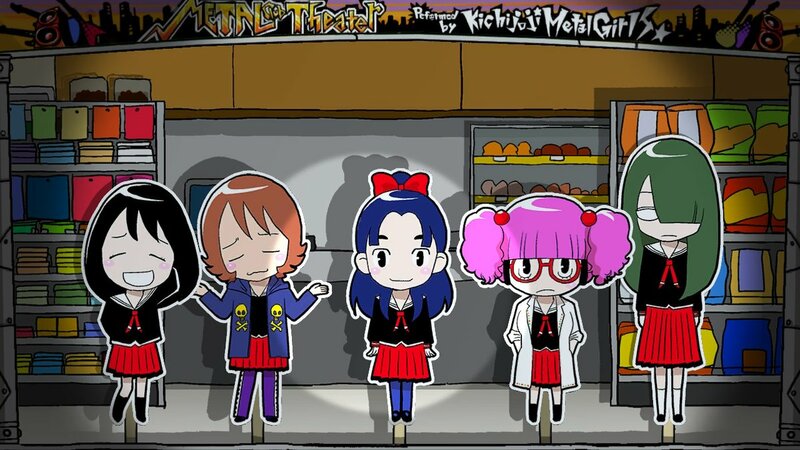 Gal Metal‘s presentation evokes a charming manga style, from the character design right down to the manga panel cutscenes. The event conversations between the girls are portrayed in a cutesy cardboard puppet manner. And occasional phone message conversations take place on an actual smart phone in the game, a clever gambit of diegetic presentation (in handheld mode, tap on the Switch’s portable screen for maximum cell phone usage effect). While the bulk of the visuals are two-dimensional, only during live performances will you see the world and the band animated in cel-shaded polygons. Can’t be too distracted while you’re focusing on the music, but that’s what watching replays are for. Props go to a colorful localization that imbues the silliness with personality-filled characters (and the hilarious pun-filled chapter titles). The school girls, each definable with simple traits like the science nerd Kia and the punkish, no-worries Shiimi, live everyday lives, hanging out at shops and arcades in a bid to flesh out the personalities. 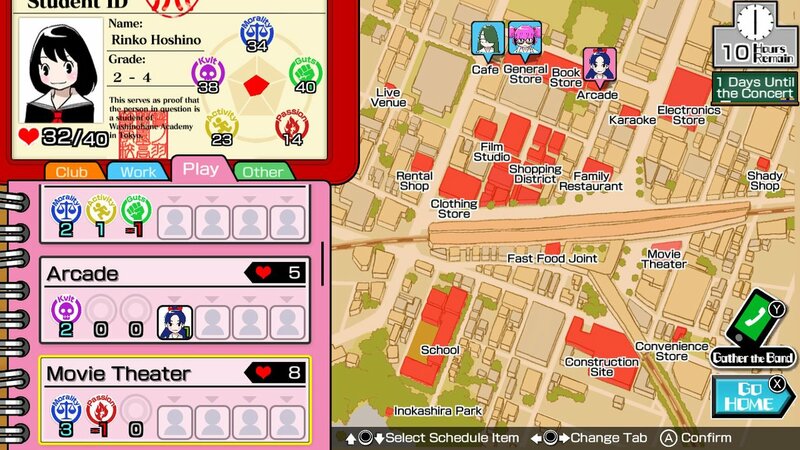 You can skip the conversations, because functionally, you’re just boosting your stats, but you won’t want to lest you skip out on getting to know Rinko’s colorful friends. 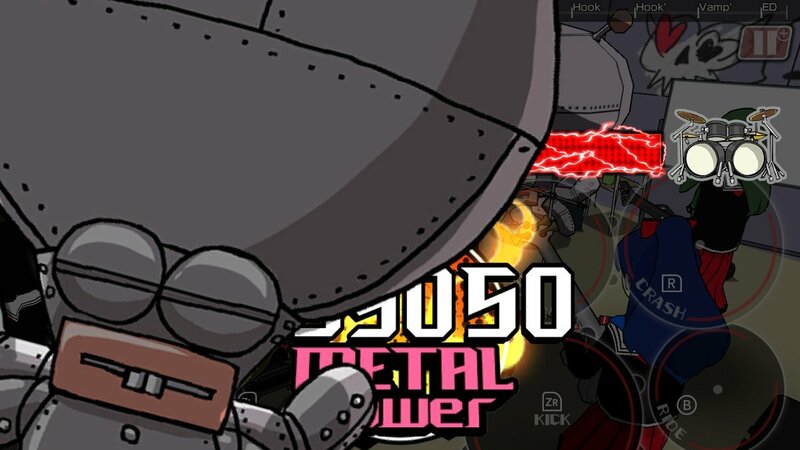 On the downside, you’ll be surprised how short Gal Metal actually is. The main campaign is a fun but fleeting ride, and it’s for solo drummers only. 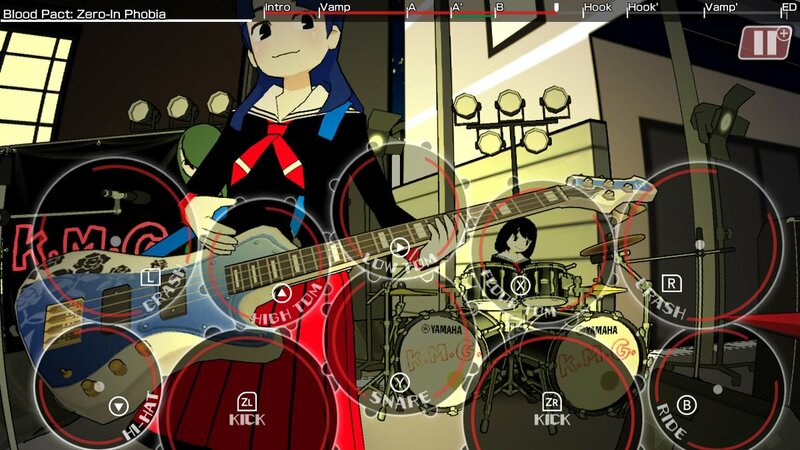 At only three hours and with only thirteen songs for $30 off the eShop, Gal Metal might be a tough drum stick to swallow. In fairness, each of the 13 tracks are so well-crafted that more would have probably diluted the project, but it’s hard not to feel short-shifted in comparison to other music games. To extend the gig for completionists, there are numerous achievements to unlock, hidden events to discover, and affinity levels to earn with all your band mate chums. But one thing I did not immediately notice was the presence of actual DLC. Within the menus, an option called “Invite a bandmate” leads to a purchase screen for the Encore Pack. This offers a good amount of extra content to offset the campaign’s short length, including 5 new songs, new bandmates, and more story. It’s currently $10 USD on the eShop, making Gal Metal’s overall package cost a more typical retail price of $40 when purchased digitally (the retail “World Tour Edition” package does include the DLC). Because it exists outside of the core game, the Encore Pack does not affect the score. I’ve got to admire how balls-to-the-walls insane Gal Metal is. It’s weird and quirky, has a flavor all of its own. The music is hip and catchy, the art is adorably charming, and the controls in all their permutations give players a lot of choice in how they want to rock out. You can imagine Tak Fuji’s goal was to appeal to all manner of gamers and age groups with his stylish experiment. In that case, he has succeeded. I can see Gal Metal work for music game fans, casual players who are taken in by the motion controls and wacky antics, and anyone looking for something super Japanese and esoteric. It’s also arguably producer Tak Fujii’s best game in a decade. Grumblings about pricing and length aside, this is another welcome slice of eccentric, accessible Japanese game design available on Switch.